AMANDA: Sun, sea, swimming pool... sounds fabulous, unless you have bleached hair. This is brass just waiting to burst forth, so I make sure I have a shampoo with a violet pigment to keep my blonde tones cooled down. Fudge Professional has done some serious research to ensure that its Clean Blonde shampoo has the strongest violet pigments on the market – great for hair, less so for hotel tiles and fingernails, so just make sure you're quick to wash both while the purple froth sits upon your wet tresses (and if you leave it on for the full five minutes, you'll find yourself a silver surfer, if that's your bag). ALISON: Packing a brush that can breeze through sea-swept tangles is definitely an essential. The last thing you need is to have knotty, frizzy hair ruining all of your holiday photos for the next 12 months. The Wet Detangler hairbrush from Tangle Teezer is perfect – the handle (yes, this one has a handle) means it won’t go slipping out of your hand in the shower and it’s amazing for helping to draw shampoo through the hair for a deep cleanse. It's also lightweight, which means you don’t need to spare a thought about your baggage allowance either. 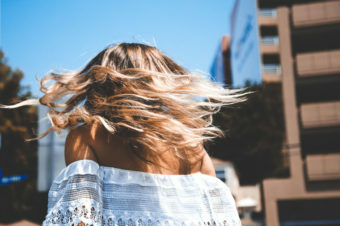 ALISON: When you’re out in the sun all day, whether it’s sightseeing, sunbathing or swimming, you’d be surprised at how damaged your hair can get. I never leave the hotel without a quick spritz of the Aveda Sun Care Protective Hair Veil, focusing on the roots and lengths of my hair. It’s a lightweight mist that defends against UV and minimises dryness. You’ll also have a cloud of that gorgeous Aveda scent following you all day, which I love. DEBORAH: No-one wants to have a Monica, poodle-head situation at the first hint of humidity. A smoothing oil or serum, which will condition and also stop my hair from defying gravity, always makes it into my case. The Davines Oi All in One Milk is my one-stop shop when it comes to keeping my hair in decent nick on holiday. It minimises frizz and keeps hair soft (vital! ), but it also helps to pump up volume a bit and gives a hint of hold for styling. It’s a do-all wonder, as far as I’m concerned, and the 50ml plastic bottle is perfect for throwing in your beach bag. DEBORAH: Another item getting unceremoniously chucked into my case is my beloved Ouai Texturizing Hair Spray. When it’s 30 plus degrees and I wish I’d chopped all of my hair off before I left, this is the only thing that I can be bothered to use to style. It somehow always improves the look of my hair. Don’t have time to wash your hair before you hit the beach bar? This helps make my bird's nest look more intentional. Hair a sweaty mass on your neck? This will boost your roots and give some grip for a messy top knot. Limp locks dying a death in the heat? 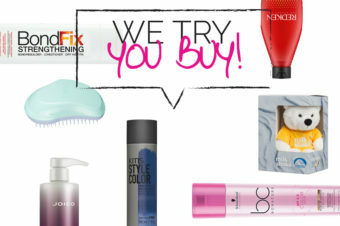 This perfect mix of dry shampoo and hairspray will give them new life. BETH: When I’m on holiday, I LIVE in the sea or pool. If I could spend all day in the water, without turning into a prune, I would. This is why I triple-check I have Philip Kingsley’s Swimcap in my luggage – that’s more times than I check for my passport. Developed for the first US Olympic Synchronised Swimming Team, Swimcap protects your tresses from chlorinated and salt water. It actually leaves my hair in better condition AFTER a day spent sunbathing and swimming. The key is to re-apply it every time you get out of the water – it’s only 75ml so will fit in your cabin suitcase and beach bag easily. It’s also the only mask my fine hair doesn’t wilt for. BETH: After Swimcap, this is my most trust-worthy holiday hair hero. Whenever I get out of the sea, my tangled locks can give Medusa a run for her money, so I swear by TIGI Bed Head Beach Freak Moisturising Detangler Spray. Formulated with a seaweed extract to keep hair from drying out, a quick spritz of this over my hair (post-reapplication of Swimcap) as soon as I get out of the sea, means brushing later becomes much easier. It’s also formulated with a UV complex so your strands are protected from harmful sun rays – bonus! ANNA: Being on holiday is a paradox – you want to look your absolute best, but you also have far better things to do than spend all your time locked in the bathroom styling your hair. Nightmare. That’s where the super-smart BaByliss PRO Perfect Curl MKII comes in. It can deliver loose waves or tight ringlets automatically and perfectly, every time. It’s also a low stress option if you struggle to curl your own hair and has a timer so you’ll never frazzle your strands – all you have to do is place sections of hair into the chamber (not as scary as it sounds) and the rest is done automatically – for minimum fuss, maximum fun. And isn’t that what holidays are all about? ANNA: If you’re worried about having a liquid spillage in your luggage (like me) then the Redken All Soft Mega Sheet Mask is what you need. Use halfway through your holiday to keep the sun and sea damage at bay – just pop on the mask pre-shower, have a drink on the balcony while you wait and let the moisturising magic happen.